By Nama Khalil, August 2, 2012 . Revolutionary street art in Tunisia. In the days following Mohamed Bouazizi’s self-immolation in the Tunisian town of Sidi Bouzid, burned and battered cars piled up inside state-owned lots throughout the country. Tunisians were expressing their anger and pain by setting fire to cars. This destruction did not last long. The image of ashes and despair soon turned into a positive, rejuvenating project. Faten Rouissi—a Tunisian artist, activist, and resident of a suburb north of the Tunisian capital of Tunis—took notice of all the burned cars crammed into a vacant lot near her home. Rouissi successfully reached out to artists, performers, students, and youth to help transform the burned cars into “blooming objects in bright colors, adorned with revolutionary graffiti.” Her Street Art in the Neighborhood project established a contemporary public space to promote art as a creative collective. The breadth of creative expression displayed on the cars is considerable. Peace signs and the Tunisian flag are common icons. Amid the rubble and destruction, rainbow-painted cars are marked by phrases like “freedom,” “revolution,” and “long live Tunisia.”One car in particular summarizes exactly how Tunisians feel. It was first painted in a light blue tone with blotches of yellow, green, and white paint, an indication that many participated in its design. Then, in bold, red letters, the phrase “Game Over” is spray-painted across the side of the car. One of Rouissi’s goals is to push the Tunisian ministry of culture to promote art in the public sphere. This project celebrates an extraordinary present, a nation’s dream for freedom and dignity. Each car also represents agency, solidarity, and hope in the future of the revolutionary movement. The visual landscape of the Arab World has changed greatly as various forms of creative expression have flourished in the days since the Arab Spring. Graffiti and street art not only played a distinct role in the political dissent of this revolutionary period. Art has also been an ongoing experience for the revolutionary youth that is strengthening civil society and the democratic process. Tumultuous change is still sweeping the Middle East, inspiring artistic expression and breaking through the decades of censorship and fear.A cultural awakening is taking place alongside the political revolution. Artists are making art that engages in critical discussions about politics, religion, culture, nationalism, and identity. They are questioning the relationship between the state and cultural production and imagining new ways for culture to transform society. Walking through the gardens of the Tuileries in Paris, you come across a labyrinth made out of grass. Once you enter the maze, you discover that the neatly cut grass has been purposefully laid out in an octagonal shape, a motif often repeated in Islamic architecture to convey unity in multiplicity. Children who play around the maze become part of the design. Only after you take a few steps back and see the maze from afar do you notice that the interlacing elements combine to make the revolutionary slogan “The People want the fall of the regime.” Designed in Kufic script, one of the oldest Arabic calligraphies, “the maze symbolizes the troubles in the Middle East,” states the artist Moataz Nasr. Through this playful and immersive form, Nasr suggests that the regime has fallen and people have collectively proven powerful. The ultimate outcome, however, remains difficult to identify. Nasr is an artist and an activist. His work not only addresses social issues but also embodies a quest for peace and social justice. It is one example of how artists are civil society actors. Throughout history, artists have used visual arts, literature, and music to open dialogue about how and why to change society. Paintbrushes, cameras, pens, and instruments are all tools used to promote or direct social, political, and cultural change. Artists help create an independent space by creating opportunities, through art, for people to engage with others about social issues. This concept, paramount to building democracies, has been in flux in the Arab World. In the decades following independence from colonial powers in the region, authoritarian regimes in the Arab world severely restricted civil society organizations, often forcing them to conform to government agendas. According to the International NGO Training and Research Center’s 2007 report on the viability of civil society organizations in the Arab World, Egypt has traditionally had one of the most vibrant NGO sectors in the region, but the government had limited associational activities since 1981. Neither Libya nor Syria showed much sign of independent organizations, whereas in Tunisia, women’s organizations as well as cultural groups were quite active despite a law prohibiting NGOs from engaging in political activity. The revolutions in the Arab world have inspired artists to use public space to congregate and support the uprising through cultural activism. Street art and political cartoons went viral across the region. Graffiti became pivotal in communicating public sentiment. Music, poetry, and chants motivated protestors. Artists reclaimed their voices, and in so doing they helped everyone else do the same. Street artist Radz in Cairo. “Art has really taken a central role in the square,” proclaims Yemeni activist and blogger Atiaf Alwazir. She notes that many artists viewed Yemen as a “grave for talent” because the government did not support or encourage artistic expression. Today, however, artists are working for a stronger appreciation for the arts in Yemen and across the Arab world. Tunisian revolutionary art was expressed primarily in street and poster art. A common icon in this artwork is a human fist. One mural depicts four arms coming out of a group of people, but the fists are at varying heights. On the right of the mural is the outline of a man throwing what looks like seeds, which help grow strong fists. Street art swept the Libyan capital, Tripoli, in the early days of the uprising, with people taking ownership of city walls and treating them as blank canvases. Salah Amr, a political cartoonist, notes how his pictures would have gotten him executed if Gaddafi were still in power. Now, he takes pleasure in drawing his popular cartoons anywhere. One particular cartoon, drawn by an unknown artist, depicts Muammar al-Gaddafi picking and eating fleas off his son, Saif al-Islam. Both are shown as crouching monkeys, while a caption reads “Monkey of Monkeys,” a satirical comment on the “King of Kings of Africa” title that Gaddafi received at a meeting of African rulers he convened in Benghazi in 2008. More traditional visual artists also got into the act. George Bahgory, an Egyptian painter, showcased new works inspired by the revolution. His exhibition, Bahgory on Revolution, opened on the first anniversary of the uprising, January 25, 2012. Bahgory’s Picasso-like paintings are heavily yet seamlessly collaged, so that every elementin his work is actually the sum of smaller pieces. The paintings appear chaotic on close inspection but resolve into wholes at a distance. 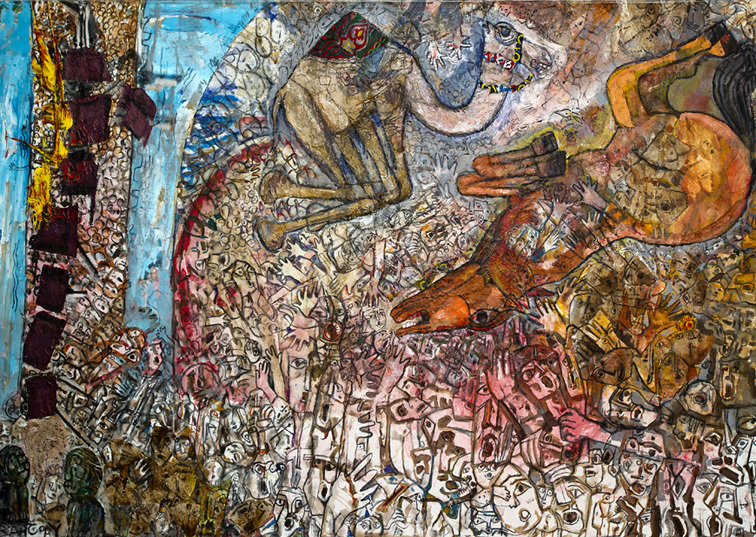 One painting, “The Battle of the Camel,” depicts a larger-than-life camel and horse writhing as they trample a crowd of peaceful protestors. Falling from the horse into the sea of people below is the culprit who rode it to Tahrir. Fadi Alharby, a Yemeni painter says that “many people think the revolution in Yemen is based on violence,” he says, “but for me it is based on art, because art is a human right, it is freedom.” The uprising has in fact been marred by violence, since fighting erupted between government forces and tribal leaders. However, this is in sharp contrast to the peaceful scenes at Change Square, where art continues to bring people together. The Youth for Freedom and Justice Movement created a studio-tent space at Change Square for artists. Art teachers are sometimes present to offer feedback and help young artists. “Art plays an important role in awareness. The number of people that come to our studio is a positive indicator of the civic state we hope for in the future,” says Hazbar al-Maqtary, a member of the group. In 2011, a week before the ouster of Zine El Abidine Ben Ali, the 22-year-old Tunisian rapper Hamada Ben Amor, known as El General, was arrested for his song “President, Your People Are Dying.” El General directly denounced then-President Zine El Abidine Ben Ali for not addressing mounting unemployment and poverty. In the days following his arrest, El General’s song was the voice that motivated the revolution by inciting young people to action – but without violence or destruction. The translated chorus goes something like this: “Mr. President your people are dead, many people eat garbage, and you see what is happening in the country, misery everywhere and people who have not found a place to sleep. I am speaking in the name of the people who are suffering underfoot.” El General was released during the uprising and preformed in front of a crowd of students. Syria’s protest songwriter was not as lucky. Ibrahim Qashoush’s lyrics moved thousands of protesters in Syria who sang his sprightly verses at rallies. The protest anthem, “Come on, Bashar, time to leave,” is attributed to him. His body was found dumped in the river flowing through his hometown. His killers sent a message with their violence: they cut out his throat. Qashoush is one of many artists who have been tortured and killed by Assad regime. The most recent is Syrian sculptor Wael Qashtun, who was tortured to death. The popular uprisings in the Arab world have greatly influenced and inspired artists throughout the world. Egyptian activists contacted Brazilian cartoonist Carlos Latuff to draw cartoons of the revolution. One of the most memorable cartoons features the image of young Khaled Saieed, who died after police detained him in 2010, dangling a tiny, struggling Hosni Mubarak by the collar of his suit. Recently Latuff created another cartoon for when Egyptian President Mohamed Morsi took office. As President Morsi climbs over an army tank, the commander-in-chief of the armed forces slyly shakes his index finger and holds open a car door that is dwarfed by the army tank. Arab Americans have also contributed to the cultural production to the Arab Awakening. Egyptian-American filmmaker Tamer Shaaban, for example, created a video montage showcasing the human drama of the protesters. Shaaban’s video, which has been called “the most amazing video on the Internet,” came out when the Egyptian government was attempting to shut down the web throughout the country. Shaaban produced another video, Egyptian Revolution—The World Calls for Peace, that features people from various countries uttering one-line phrases in support of Egypt’s revolution. Festivals and exhibitions have been programmed to showcase work inspired by the Arab spring. The Arab Spring Art Festival invited artists to submit work that would then be exhibited in Cairo in January 2012. Unfortunately, the festival was postponed “because of the exceptional circumstances Egypt is living right now.” Events in London and elsewhere are highlighting responses by Western painters, poets, and musicians to the Arab Spring. Several articles have expressed concern that Islamist forces represent a danger to arts and culture at large. The case against Egyptian actor Adel Imam, for example, who was convicted of blasphemy for his role in a film, caused much debate. The discussion surrounding this case was solely framed around “the future of democracy and human rights and rights to freedom of thought and expression.” Although this debate is necessary for building democracies, what is also necessary is a thorough engagement with the implications of blasphemy laws and the limits on freedom of speech in a democracy. Often overlooked in this debate is the support for cultural industries in mainstream Islamist circles as a whole, as well as the reasons why some Islamists oppose certain representations—for instance, because certain forms might encourage immoral behavior or the vain imitation of God’s creation. Islamist groups that suppress the arts, like the case of recent Tunisian riots in which a group of conservative Muslims clashed with police over an art exhibition, are widely understood in the Islamic world to challenge art that insults Islam as a religion. This is not an unfamiliar concept in the West, where some countries—like the United Kingdom—have blasphemy laws against insults to Christianity. However, another strand of Islamic discourse views art as a vital part of Islamic tradition. In Egypt there has been a movement for “Purposeful Art,” a phenomenon encouraged by two preachers, Amr Khaled and Moez Masoud. According to these preachers, the purpose of this type of art is to bring “Muslims closer to God, build the ummah, raise its cultural level, and counter the threat of immorality and identity loss seen to come from globalization and secularization.” In this sense, art is an especially helpful tool for building a cultured community. Islamic music videos, for instance, have become extremely popular throughout the Muslim world and have helped to build connections across borders. Art creates a dialogue between the artist and the audience. Under the old authoritarian systems, this dialogue was so often uni-dimensional. As a result of the tumult in the Arab world, the dialogue has expanded considerably. In fact, it has helped to foster a more vibrant civil society and to point the way toward more durable democratic institutions.